As bloggers go, we’re always trying to get more things done. We sometimes feel as if there simply isn’t enough hours in a day to do all the things we set out to do. When people think about what a blogger actually does, they immediately think of somebody that does nothing but write and publish content all day along. Well, a blogger is actually responsible for a lot more things than just publishing content. Ensuring that their blogs are regularly updated with useful content, a top priority. Ensuring that they engage with their readers and audiences, responding to comments and emails in a timely fashion. Ensuring that they carry out frequent and timely maintenance checks on their blogs. Ensuring that they’re marketing and promoting their blogs and content correctly. Making sure that they’re responding to guest post inquiries and reviewing submissions properly. Making sure that they’re investing money in the right areas for promoting blog growth. Ensuring they are regularly monitoring and measuring their efforts and progress, and using marketing and automation tools to fine-tune their strategies. Ensuring that they’re building a strong social media presence. So, now you can see that blogging simply isn’t just about creating great content, running a blog means that you’re in charge of so many other intricate and important extensions of blogging. OK, so I want to share with you 12 powerful productivity tools and apps for bloggers. Many of the tools listed below I’ve either used in the past or I’m currently using right now. WordPress is the most flexible website building and content publishing tool on the web. 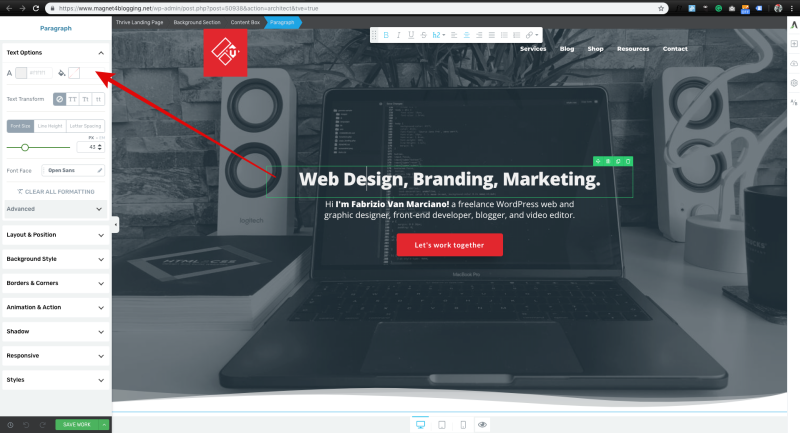 With a WordPress website and a small handful of functional plugins, and, of course, a great looking theme, you can create the perfect website fit for any purpose. How can using WordPress help to increase productivity? WordPress is a CMS designed to help you create and publish dynamic content. 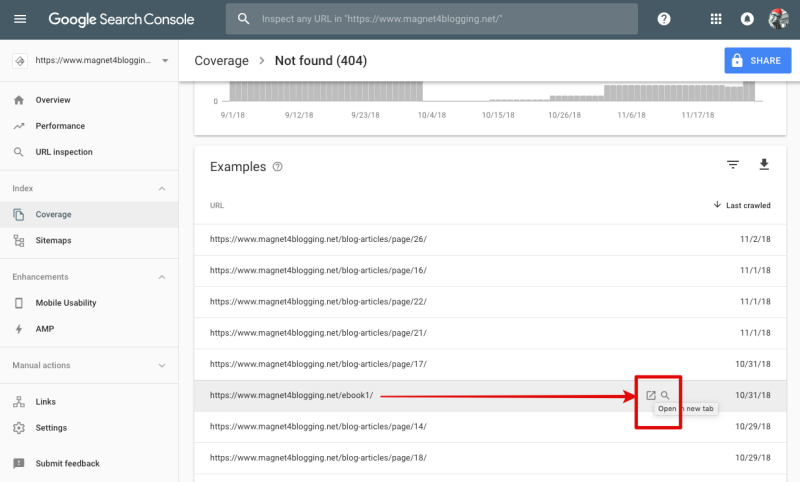 It automatically does this for you each time you hit publish on a post, saving you tons of time having to manually organize and display your content in chronological order. YouTube is without a doubt the most popular and largest video content hosting, sharing, and marketing platform on the web. It’s also a popular search engine, and many bloggers use YouTube to promote their blog content and grow a visual audience. Getting into video creation doesn’t have to be expensive or technical. If you have a smartphone, then start there. Go and download the YouTube Capture app. This app will allow you to easily create, upload, and share videos straight from your smartphone to your YouTube channel. If you want to go all out and start vlogging to promote your blog, then that’s great. Read this post for top tips and suggestions. How can YouTube help you increase productivity? YouTube is a ready platform, so you don’t need to host your videos on your website or blog and use up valuable resources. YouTube will help you reach a wider audience for your blog and it’s inexpensive! 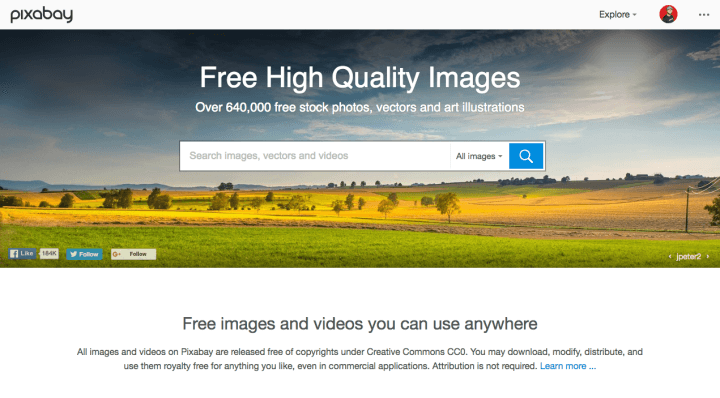 Pixabay is a great resource site for finding high-quality stock photos and graphics to use in your blog posts and content marketing projects. You can also contribute by uploading your own images to Pixabay for other users to use. How can Pixabay help you increase productivity? It will save time in having to find or even capture quality images to use in your blog posts. SlideShare is a free popular content marketing platform ideal for uploading and sharing beautiful slide presentations, infographics, videos, and various other marketing documents. It is also a great place to find content to add to your own blog posts and content marketing projects. Just be sure to give credit where it is due for content you use. How will SlideShare help you increase productivity? It’s a great platform to use for content repurposing, and tapping into a whole new audience for your blog. Audacity is a free audio recording desktop software that you can download onto your PC and use to create quality audio content, such as podcast episodes for your blog. How will Audacity help you increase productivity? It will help you easily record audio content so that you can use as podcasts, or as voice-overs for your videos. Audacity is also free. Thrive Architect is a premium one-of-a-kind, all-in-one, drag-and-drop, content creation and landing page builder tool for WordPress. Wow, what a mouthful that was. The plugin comes with a host of features including design and functional elements, landing page templates, mobile responsive design tools, and more. You can learn more and purchase this plugin here. How will Thrive Architect help you increase productivity? First of all, being a drag-and-drop page builder, it means you can create and deploy attractive sales and landing pages quickly without needing to touch a single line of code. Moreover, you can do this yourself without the need to hire a developer, so you save money too. The Buffer App is one of my favorite social media automation tools, however, these days I no longer use it. With Buffer, you can schedule or post messages directly to Twitter, Facebook, Google+ and more all from a single place. You can integrate the Buffer App with your browser, or download the app onto your smartphone and take your social media automation activities on the go. Buffer App is completely free to use, though, there is a premium service which allows you to post unlimited posts and access some other features such as analytical tools. Click here to go to Buffer. How will Buffer App help you increase productivity? Social media automation is important, especially if you want to save time so that you can focus on other areas of your blogging business. Buffer App is a great tool for doing just that. The reason I no longer use Buffer App is that I now use CoSchedule, and I have been since the middle part of 2018. 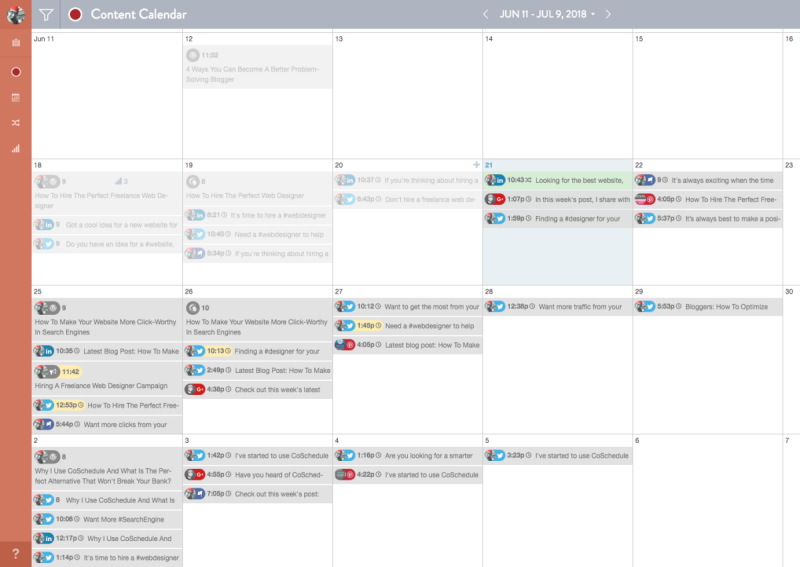 CoSchedule is a premium web application marketing calendar for bloggers and entrepreneurs. Not only can you automate your social media messages across many social platforms using CoSchedule, but you can also schedule your blog posts, email marketing newsletters, and more. While this is by far NOT the cheapest option at the starting price of $49 per month, since starting to use CoSchedule myself, the time I’ve been able to get back has been priceless. How can CoSchedule help you increase productivity? Well, that’s easy. You save a ton of time, including your sanity, and all your content marketing automation is in one place. Google Analytics is the most widely used website traffic analysis tool on the web. The best thing about it is that it’s 100% free. Sure, it doesn’t provide you with all the information you need about your website visitors behaviors, but it’s a darn well good starting point. Google Analytics is not only great for monitoring website traffic, but also useful for setting conversion goals, tracking visitor journeys, exploring most popular content pages, monitoring visitor bounce rate, time on site, and more. Click here to visit Google Analytics. 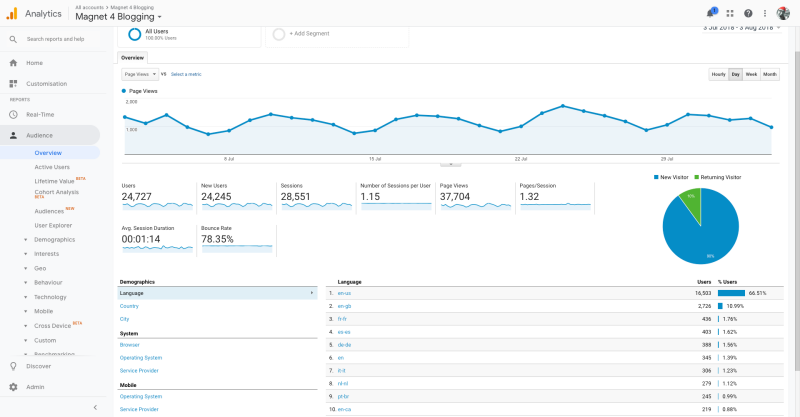 How can Google Analytics help you increase productivity? GA can save you so much time and money. You don’t need to spend money hiring a professional analytical expert, just sign up to Google Analytics if you’re not already using it. Google Webmaster tools will provide you with all the tools you need to explore and maintain your website’s health on the web. You can think of it as a “first aid box” for your website or blog. Where to make HTML improvements. Information about any manual actions taken against your site. 404 Error pages and more. How will Webmaster Tools help you increase productivity? GWT will help you identify any problems you may have with your site that can affect it’s performance in the search engines, so that you can fix those problems in a timely fashion. Evernote is a great productivity app for keeping everything organized with your blogging tasks, from writing content, doing topic research for your next blog post, to creating to-do lists. Click here to try Evernote. This online app is useful if you want to improve your writing, and, save time when editing blog posts in the future. Click here to check out the Hemmingway App. A simple and distractive-free writing app for iOS and Mac OS. The only app I actually depend on for writing blog content. Check out the Byword App here. Right, that’s it for now. I’ll be updating this post in the future when I find more wonderful tools and apps for boosting blogging productivity. For now, though, make good use of these. you listed some very interesting and useful tools. Hi Erik thanks for visiting my friend, great to hear from you. I’ve used Audacity for creating podcasts before it’s a great tool. I discovered Thrive Content Builder earlier this year and it’s been one of the best investments I’ve made 🙂 All the best mate and have a great week. Thanks for compiling this great list. Proofhub.com is also a very useful tool in boosting productivity for bloggers. Have a look as well.